Whether your family gets an updated portrait every season or once every few years, you want to look your best. A big part of creating a portrait that looks great on your walls is coordinating your clothing. As your photographer, I would love to consult with you about your choices. Feel free to send me pictures of your outfits or ask for advice. 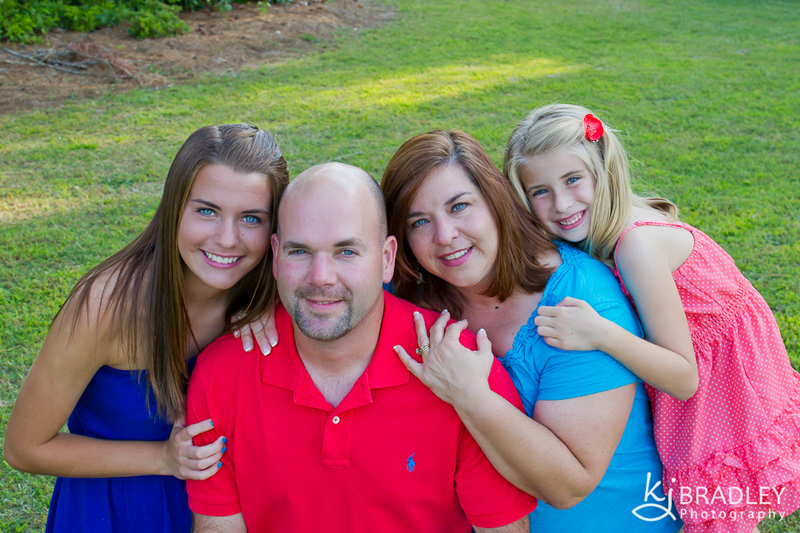 Here are some simple guidelines for amazing family portraits every time! Rule 1: You don’t have to match exactly. That’s right, everyone doesn’t need the same color shirt. Mix it up to add depth and interest to your picture. If you are less daring, just mix tones of the same color. 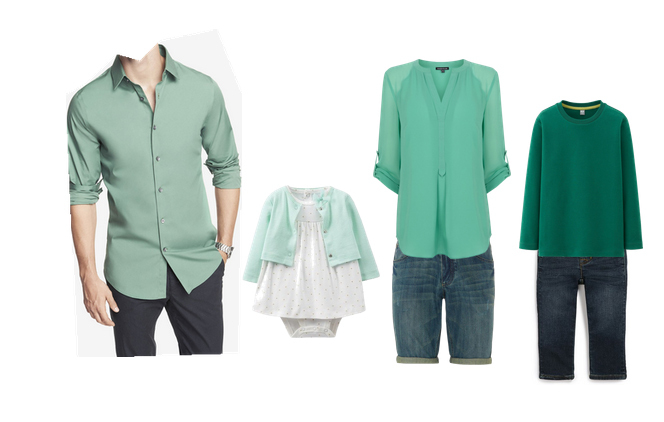 The example below shows how a family of four can mix deeper shades of teal with lighter shades. This mixup adds more interest than the same family wearing 4 matching shirts. No need to match. Pick different tones of the same color for depth and interest. 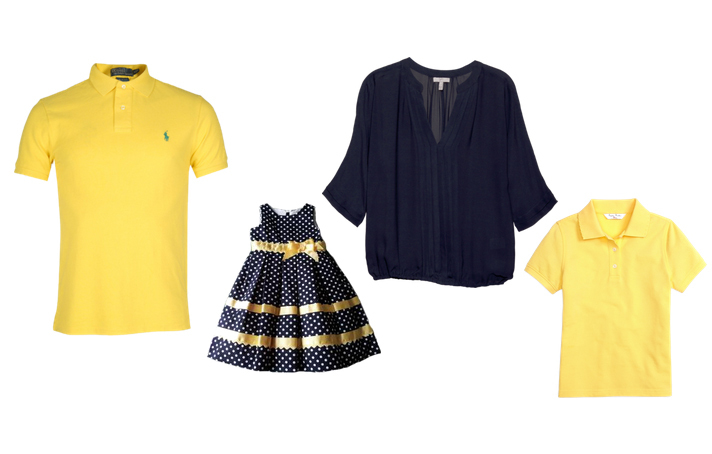 In the next example the family uses two colors, blue and yellow for variety. Choose two colors and mix them up. Rule #2: Dress the family is a single person. Consider the same rules you use yourself when putting together an outfit. I tell my pre-teen boys “no more than 3 colors per outfit” and “don’t mix patterns.” This helps them to not put a red/blue/yellow pair of plaid pants with a pink/green striped shirt. Yes, they would do that. Follow similar guidelines when dressing your family. You usually limit the colors you wear at the same time, but you might have accent scarves with many colors. When you wear your colorful, patterned scarves you pair them with simple, solid blouses and sweaters. The same rule applies to family portraits. If your two year old is wearing a complex Matilda Jane outfit with lots of colors, dress the rest of the crew in solids with colors from the toddler’s outfit. Rule #3: Cover Up. Unless you are buff and you want to highlight your fab muscle tone, it is usually best to cover as much as possible. 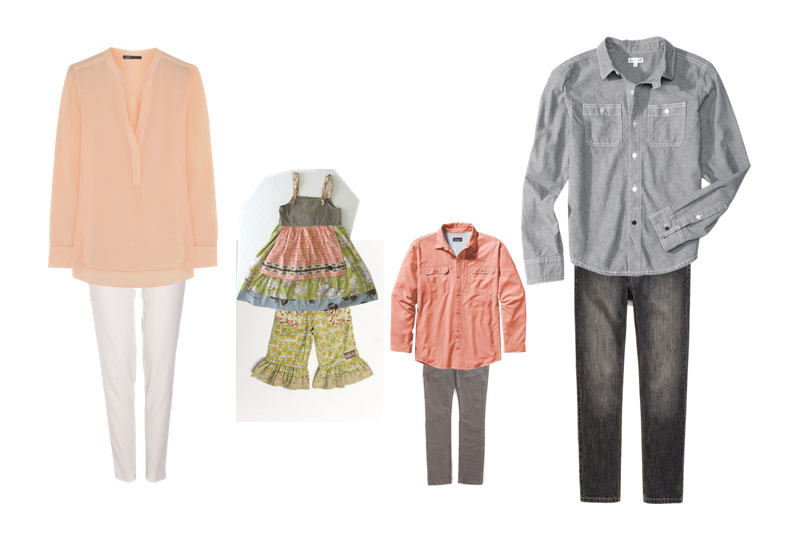 Three quarter length or long sleeve shirts and long pants or capri pants are usually a safe bet. Remember, you may be sitting and posing with children in your lap so consider how your clothing moves when you do. Rule #4: Black or white shirts may be popular but they aren’t always the best choice. One of the most popular family outfits is that with everyone wearing black shirts or white shirts. That is because they are easy to match and many people have these staples in their closets. There is nothing wrong with that choice, but there could be better options. Do you look good in stark white? Probably not unless you have a good tan. Black often leaves a visual void in a photograph. If you do decide to go all black or all white, consider adding an accent color around the face. This strategy works well to make children and ladies stand out and to break up the black or white. Rule #5: It’s about you. Above all else remember that your pictures should highlight YOU, not your clothes. Avoid crazy patterns that bring attention to the outfit. Stay away from neon. Avoid neon. Don’t dress in neon. If any one or the whole family wears excessively bright colors, or patterns, that person’s clothes will be the visual focus of the picture. If you mix very dark and very light colors, your eye will be drawn to the contrast in outfits rather than faces (example: One person in white while everyone else is in green). If you are trying to make young children or special family member stand out, this would be the time to dress them in a light color (not neon… do not wear neon), however for most cases it is best to avoid it. Finally, the rule of rules is that they are made to be broken. At the end of the day, you need to be comfortable and wear clothes that represent your style and personality. Put everyone in bright colors or mix up small patterns a little. 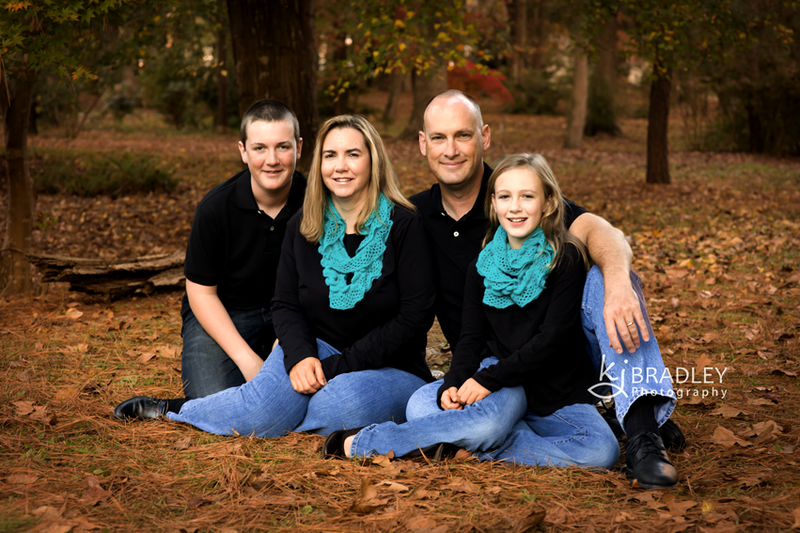 My family has broken every rule, and I have photographed MANY families who broke the rules and pulled it off, so don’t cancel your session because you are at a loss for an outfit. Show your personality. Breaking the rules can work if you are careful. You can also look at the “What to Wear” posts right here on the blog for more details and inspiration! The source of outfit collages used in this post was Polyvore. Photos of people are copyright KJ Bradley Photography. Reader’s Choice Award 2014 – Thank YOU!